Green Writers Press, 9780997452860, 96pp. Book 2 of the Josie Goes Green series finds our heroine is back in Ecuador, this time in the Amazon jungle village of Sayaku. When the book starts, Josie and her new friend Lucia get lost in the rainforest and get terrorized by leeches. Then they meet a jaguar and follow her back to the path. On a crazy hike with the village leaders, they learn that the jaguar's forest home is threatened by loggers. Back in Brooklyn, Josie and her pals from Book 1, Josie and the Fourth Grade Bike Brigade, work to save the jaguar by stopping the logging. They help Sayaku sell a special solar jar that can make money for the village. They raise money at a dance. They publish photographs in the local paper. They paint a special jaguar logo. Their teacher even invents a new dance. They have done everything they can. Now it will be up to the people of Sayaku to decide whether to allow more logging or to save the jaguar. Grandma Carmen is on the scene in Sayaku. Josie is going crazy waiting to hear the news. In each Josie Goes Green book, Josie takes simple, ingenious actions that bring real changes to her neighborhood and the world. As the protagonist in the series, she will inspire young readers to understand environmental issues and take action. 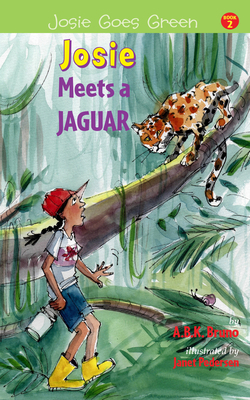 Josie Meets a Jaguar celebrates young environmentalists across the world and reminds us that we can make a difference in the fight against climate change.